A unique event for the housebuilding, construction and property sectors. 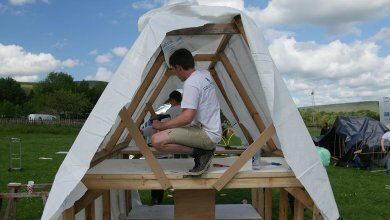 Pull your employees together in teams of 4-6 to design an innovative shelter and collect the building materials to take to the Peak District. Showcase your CSR values by supporting one of the world’s leading shelter NGOs. Unite with your staff through a series of mental and physical challenges. Meet & compete with lots of teams from across the industry. When you arrive on Friday you will have to construct a shelter out of your own materials, make sure it’s safe and comfortable enough for all team members to sleep in on Friday and Saturday nights. You will have until 5pm on Friday to complete your shelter. A trip to one of our overseas projects whereby they will have the opportunity to build a home for a family and take part in a leaving ceremony to celebrate handing the home over to them. Flights, accommodation, and food costs will be covered. This is a unique opportunity for the winning team to see the impact that their fundraising has and to work alongside the families that they are building for. For more information on volunteering abroad follow the link below. A team can pay a flat registration fee of £300 for a team of 4-6 people. There will be a link following your payment confirmation email for all team members to register. Get registered on Charity Checkout - click on the "Start Fundraising" tab below, then click "Fundraise" to create your team fundraising page. Start fundraising and designing your shelter to have the best chance of winning! The challenge has 4 elements for your team to tackle, from fundraising to construction & treks. Is your team up to the task? The challenge is split into four different stages. The winning team will be the team with the highest point score. Preparation is everything. You'll find here the event schedule, itinerary, directions as well as a kit list for your team.